Written by Isabella Anderson So I am in San José for two days, and I’m visiting some touristic spots before I continue touring Costa Rica. I went to the Central Market, did some shopping, ate traditional food and tasted fresh made costarican coffee. Not bad for a rest day in my Costa Rica travel vacations! I walked over the Central Avenue Boulevard, a pedestrian route that crosses a big part of the city from east to west. Thousands of people walk there at every minute, but being a tourist is an advantage that allows you to discover many things that local people tend to miss. 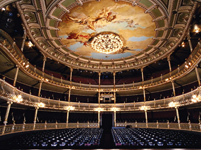 After the Central Market, the obligated stop is the Teatro Nacional (National Theater). You have probably seen the building in the postcards and Costa Rica travel guides, and once you are there, you realize why. Costaricans are very proud of its National Theater, built in the late 19th century as per our guide. It transports you to another era, and its beauty is remarkable. Tours are usually done during the day, but in the night the theater also shines with an impressive illumination that is worthy of better known landmarks in other cities. Once inside the building, I was amazed by the decoration. You feel like being in some place in Europe. It is exquisite. Stone, granite, marble, gold, woods, sculptures, iron and other materials were used. A beautiful painting depicting the costarican “coffee and banana exportation” economy of the period can be seen in the roof. It is a three-level venue with 1,000 seats, built with special acoustic conditions. Social spots in the theater are common, and there’s a cafe at the entrance of the main hall in case you want to drink something. It’s pricy but unique. In front of the theater, there’s the Gran Hotel Costa Rica, with a beautiful terrace cafe with a wonderful view of the theater, also some small cafes over the boulevard across the theater. When the night comes, you can appreciate the view of the illuminated building.